It just gets more interesting. 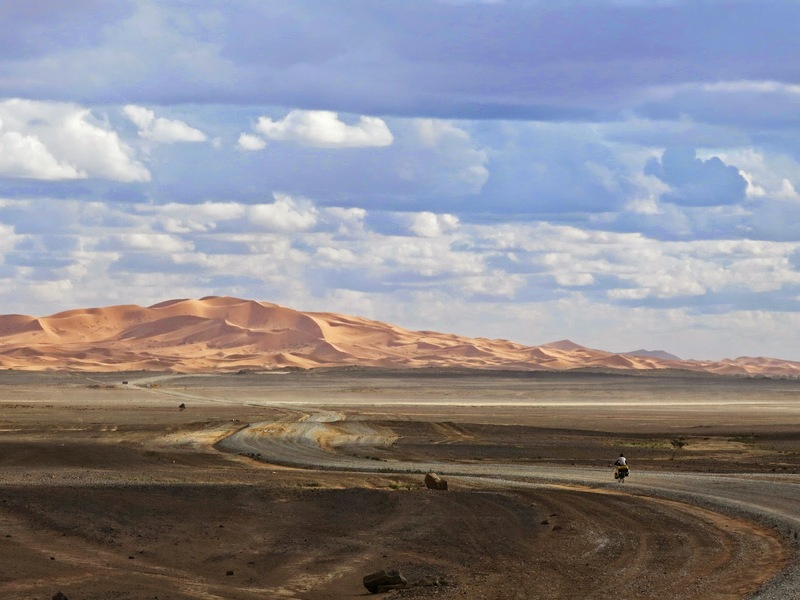 Nine months and over 9,000 miles of cycling since leaving Seattle, I write this update from the edge of the Sahara desert, at a hotel that is literally where the eastward road ends in central Morocco. Yesterday morning, before breakfast, I left the hotel alone and walked a mile into the desert, climbing up and over numerous dunes until my footprints were the only tether back to the hotel. The sea of sand, broken only by occasional tufts of grass, was the perfect remedy for the stress and frustration and suffocating energy of the medinas in Tangier and Fes. It’s these medinas, ancient walled labyrinths of impossibly dense homes and markets, which I wish to tell you about. “The key to surviving the medina is to learn one way in and out and to not deviate. I didn’t add a second route from my house for two years and I still don’t know a third.” Irwin, a British ex-pat and owner of the house we’d be staying in for the week in Tangier, stopped to look me in the eye as he spoke, to make sure I understood the importance of what he was saying. He led the way through the cart-wide maze, past myriad shops selling all manner of Moroccan lamps and ceramics, to Café Tingis in the petite-socco, a favorite haunt of Paul Bowles, Jack Kerouac, William S. Burroughs and the generation of beat writers and thinkers and addicts and pedophiles who moved to Tangier during its heyday in the mid-20th century. From there, we continued through the grand socco to a café near a promenade overlooking the Strait of Gibraltar and the foreign world of Spain and Europe. It was up to me to lead us back. The skills I’ve accumulated as a lifetime gamer were about to be put to the test: the medina reminded me of the old Phantasy Star games what with the narrow field of view, the towering walls blocking out the daylight, and my natural first-person perspective. Everything looked the same if you weren’t searching for the details. Younger gamers should envision the markets in Assassin’s Creed, only turned up to 11. And without the haystacks. And so I led the way back into the dimly-lit market: left at the produce stand with the pinwheel arrangement of carrots, past the olives, and right onto the street leading downhill. Keep going, look for the small rectangular sign for the Kasbah. It’s near Café Tingis. Make a left there. Yes, the very narrow alley that looks like a path to someone’s house. It’s a road. Follow it uphill. Keep going, keep going Doug, and look like you know where you’re going. The touts will be all over you if you hesitate. Listen for the parakeets. Ignore the turns and twists. Follow your ears. Okay, four roads intersect in the plaza with the birds. Approach the birdcage and look for the animal skins. To the right of the skins should be a sign that says “Lion.” Go that way. Okay, now count the shops selling soda and bread, but only the ones with propane tanks. One, two, okay, now look to the right for a pink wall. That’s the alley with the house. Third gate on the left. I learned that way in and out of the medina rather well and never got lost in our week-long stay. I even added a second route in that time, but we won’t tell Irwin that. Then, four days and 190 mountainous miles later, I put those skills to the test again in the much larger and far more intimidating medina of Fes, the cultural center of Morocco. Ignoring the constant offerings of help and directions from the ever-annoying touts and faux guides can test anyone’s patience. I can barely tolerate the in-store greeters we have back in the United States, and struggled mightily to control my anger as people tried to lure me into their restaurant or store, sometimes by hand. I was also constantly being asked where I’m from -- a veiled reminder that I’m not from around here and everyone knows it – and where I was headed. I knew not to tell them anything as they’d follow along and then demand a tip for “guiding” me to the hotel I was perfectly capable of finding. Fortunately, within a day, I had a very good sense of where I was going and, even when just wanting to wander, would employ a determined, businesslike pace. It was with great joy and triumph that Kristin and I soon found ourselves being ignored completely by the touts, and even being bid Salaam Alaikum as we walked the streets of medina. It would be easy to continue on about the range of emotions we felt every day in this beautiful, crazy country: from blood-boiling anger and frustration to confusion to tremendous joy, gratitude, and affection. The frustrations and annoyances experienced by westerners traveling to Morocco are well documented. But it would be wholly unfair of me if I didn’t defend their actions. What we soon realized was that everyone, including other Moroccans, were suffering the same pressured sales tactics. Especially by restaurant owners and their hired touts. It wasn’t personal, these folks just really need the business. And if you give them your business, and you return a second time, they will love you for it. In Tangier, upon returning to the same produce stall we bought from two days prior, I was greeted with a very warm welcome as the shopkeeper held his hand to his heart, spoke his appreciation in Arabic, and then hugged me. He insisted on adding some free tomatoes to our bag of vegetables. In restaurants that we stumbled upon – and miraculously found again – our returning to dine there repeatedly was always greeted with increasing hospitality and a little something extra. In the crazy, bustling, aggressive medina of Fes, at a wonderful little restaurant with seating for eight, the owner took her leave halfway through our meal to go and secure us some pastries from elsewhere in the medina, as a gift for our eating her food a second night in a row. She then hugged Kristin and kissed her cheeks as the husband did likewise to me. These were just a few of our experiences in Morocco. We’ll be in the country for a month before embarking on a 50-hour ferry crossing to Livorno, Italy. For those interested, my wife Kristin recently wrote a blog post about what it’s been like being a western woman traveling in a Muslim country. You can read that here.